You know the drill. You can forget to pick something off the floor. You can detest a cord that’s in a picture. You think you have a great shot until you see it on your computer. Would your day improve just a little if you knew you could FIX those oop’ses within seconds rather than taking a new photo shoot? For free? Photo editing is where it’s at, friends! I would NEVER publish a photo until it’s run through the freebie program Picasa. There are other programs others can share with you in comments. 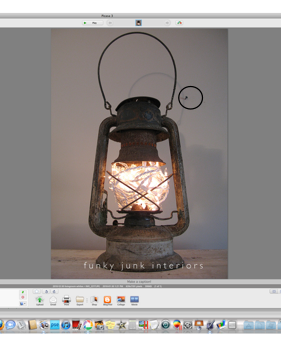 However out of the two that I have, I go to Picasa even before I go to Photoshop Elements. I’ve covered how to play in Picasa before HERE. However, today I’m going to share my #1 most fav fix of all. 1. Download Picasa (at Picasa.com) if you don’t have it already. It’s free and you’ll love it! 3. To the left side, you’ll see this box. 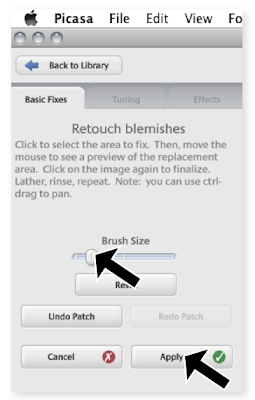 Select Basic Fixes, then select Retouch. 4. Hover your pointer over your photo and you’ll see a circle. That’s called your brush. 5. Go back to the box and create your brush size. 7. You are done. The 2nd circle click takes a picture of the 2nd location and puts it into your first location. I use Retouch for nearly every single photo. But I do more than that as well. See this awful night shot? And that ugly chain along the ceiling? This is what it looks like after I ran it through Picasa. Seriously. Wanna know how I tweaked the tones? You can read about my first Picasa lesson HERE. And then I suggest to play play play. You’ll soon see what works and what doesn’t. So.. stop sweating over those small oversights in your photos. Fix’em up later! My camera is a point and shoot and I do 99% of my editing in Picasa. This post is proof you don’t have to have the highest end equipment on the market to get great pics. With a little know how, you can improve your own photography 100%. Love photo tips? I’m coming up with a more thorough way to share photo editing and photography info with you, so stay tuned! This is only the tip of the iceberg. What’s your favorite photo editing feature? And in what program? I brighten, retouch, adjust levels, etc. on iPhoto first. Then I do final touches such as adding blog name, layering, feathering, etc. in Photoshop. Liquify in Photoshop CS5. I lost 5 easy pounds like THAT! And the entire Design Suite (photoshop, illustrator, etc etc)was only like $179 with the student discount. WORTH IT!!!! I am going to have to try out Picasa. I need a photo editing program now that I have a good camera. I like what you did with it here. Thanks for the tips! Um wow! And here I thought your house, projects and pictures were perfect! Glad to know I’m not the only one who can’t do it! (except mine is usually a stray toy, pair of underware or dog paw in the picture!). I use picnik for tweeking, but I don’t think it has this capability without paying for it! Thanks for sharing! 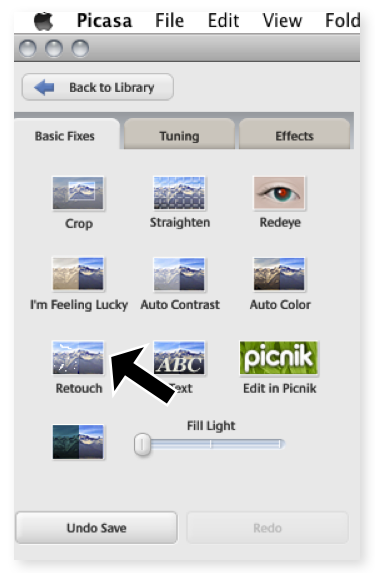 I use Picasa, but I’ve never used the retouch option. Guess I should give it a try. This is great information. So nice of you to share this. I am going to spend some time on picasa after I read your other post on the ins and outs. Thanks. Thanks so much for always sharing the best tips. I can’t believe the difference in your pictures! I use a cloning stamp in Elements. Makes lots disappear! I also adjust the lighting sometimes by just adding a filter. OMG, I don’t publish a picture until it’s gone through Picasa! Oh…the dirty little secrets we have (not so secret!)! And if I have “people” pictures, like the ENTIRE (or almost) family for a Christmas shot with the camera timer…then I take at least 3 or 4 or however many they will tolerate. This leaves the option to cut and paste things like better smiles, open eyes, and sometimes entire heads in Paint from one picture to another, then I finish up by softening the “fix” in Picasa. Yes, I know there’s a new photo editing program out there that will do that now…HA…I’ve been playing “make the family look purdy” for a long time now!! Thank you Donna. I have so been wanting to do some photo editing because point and shoot is what I’ve got to work with at the moment and I’ve been posting some blah photos. Thanks for the tip. I am going to download Picasa immediately! Thank you. Thanks for the tip! I use Picasa all the time, but I didn’t know about that. Picasa is wonderful! I have used it now for about 6 months. I do have to tell you though, they have a new something going on, that they are telling bloggers our space is full and we must pay for more storage. Then if you go remove some photos to make more, before actually paying, you remove them from your blog. So word up, word wise…this may happen to you. It is only 5.00 but that is besides the point, it really is not free in the end. I must be livin under a rock! It wasn’t until this past year I even tried photo editing. I will be downloading Picasa pronto. THANKS DONNA! Thanks for the tips Donna. I run everything in picnik then in Photoshop Elements. Fantastic, I needed this yesterday to hide a chord, check out what I mean on my blog. Thanks for the tips. I’ve often wondered what programs to use. I’ll have to check it out. Thanks. That chandelier difference is ridiculously amazing. I have Picasa downloaded, but I didn’t really know that it could do more than tones. I catch myself thinking…oh…I’ll just fix that in photoshop rather than vacuuming! But really…there seems to always be some silly little thing that shows up that I just magic erase out! I use a program called SnagIt! It is wonderful for snagging things off the web, even in videos. I also use it for resizing and cleaning up photos. This program does so much, but I have just scratched the surface. I love the full version of Photoshop, but alas, I do not own it. One of my kids clued me in to Gimp recently, so I’ve been using that. It’s free and intuitive if you’re familiar with Photoshop. I think I will try Picassa, as it looks very easy and intuitive. It might be much simpler and quicker than Gimp. Thanks for the tip! I love Picasa also! Thank you for sharing the tips 🙂 I think most people tend to underestimate it because it’s free. I also like Photoscape and Picnik (also free)but I use Picasa 99% of the time. I use photoshop. But I must say the better I get at using my camera the proper way the less, post-editing I have to do. I really should check out Picasa again, I have it on my pc but I hate the fact that it will always automatically start loading pictures from all over my computer and that I have limited control over how to store them in folders. But no matter how many times I edit my head onto Brad Pitt’s body, it just doesnt look right. I think I need to figure out how to streamline the spot where the double chin meets the neck. I love Picasa, I use it to make mosaics and it is easy to use, lately I have fun with PhotoScape to make the pictures look antique. One problem I have is once I start I can’t stop and before you know it’s night time..
Well, slap me silly and call me Sally! I have been using Picasa for 3 YEARS and never used that feature before. Seriously! I didn’t even notice that it was there. This post was so helpful I can’t stand it! I have a Canon point and shoot and I know I can do so much more with it than I am. I can’t wait to read more of your helpful photography hints! Donna, thanks so much for your useful photo tips. I have learned so much from your post. Now I’m off to check out retouch. This is such a timely post, Donna! I have been reading various blog posts regarding photography, and so far I am quite confused! This post on retouching really makes me think I can do a decent job with my pics and make them “not so ugly”! I think you are the guru girl of blogging when it comes to this kind of stuff and what a good sharer you are! I am a bit smarter than a moron, so I hope I can figure it out. I have Picassa and use it alot but never tried the touch up mode. Thanks for the lesson 🙂 It certainly does a great job on the pics you have. I am going to check out Picassa !! You’ve done it again. Wonderfully, informative post. Will give everything you said a try, as most of my shots are indoors. Your very talented. Gah! I’ve never realized how the retouch was used, so, I’ve become a master at cropping. For me it’s usually my ugly ceiling. Have you found that you can get everything tweaked, then when it’s uploaded your colors get faded out? Maybe it’s because I don’t import through Picasa? Have you noticed this? Wow, that works great, thanks for sharing. I use picnik and paint.net which are both free. Since nearly all my photos are shot with a cell phone camera (from a flip phone, no less) I have to edit all of them. I tried Picasa in the past, but it seemed too intrusive, gathering all my photos and rearranging them and such. The retouch features in Picnik are part of the paid service, but my daughter and I share the program and it’s pretty reasonable for a year’s service. Thanks Donna! I think you may have just saved me (and my bank account). I have been trying to save up for a new camera thinking I needed one to up the anty on my photos. If Picasa will fix things for me and my point and shoot, then I can save up for a rainy day instead! Picasa is all I use and I LOVE it! I’ve tried lots of different programs and that one is by far my favorite (and free!) I also use Paint.net as my free version of photoshop too. Love it. Picasa has become my go-to for photo editing. I love it…it’s so easy to use and like you showed, the results can be quite dramatic. that is so cool! i just tried it on a family pic that was great but had too much of my leg showing….fixed it perfectly! Thanks so much! What would we do without you? Great tips! This is such helpful information. But, I have a question. I have only used Picnik. What is the difference between Picnik and Picasa? I use Picnik to change tones, exposure, etc., but not to retouch. Thanks. I am with you! touch up is where it’s at, for sure…..I don’t know what we did without it…..smiles. Keep the photo tips coming! I always love finding out about great (free!) software. This year I’m really trying to clean up my photos before I post them. Cute lantern- like how you used those lights. Thanks for this Donna. I use Picasa and Picnik. The images I edit in Picnik are stored in Picasa. I find Picasa very user friendly. Like many above I have never used the RETOUCH before. There are some features in Picnik I prefer like some of the watermarks, effects, and textures. I do try to go easy on the effects. A little goes a long way but it is fun to play. The important thing here is not everyone has a big expensive camera or knows how to use and this software really improves the image taken. Ok,I’m probably the only one that is having troubles. Where are the complete step by step instructions? I’ve downloaded it and have been trying some of the editing but can’t exactly figure out some of the choices. For instance, how or can you have a black and white picture with one item colored? I love picasa! As a card maker my favorite tool is straighten so when I photograph my cards I can easily straighten them for my blog posts. Great tips Donna! Keep ’em coming. I use Photoshop, but I’ve been using it for over 20 years and it’s a must have at work. Donna, Thanks for the info! I just starting using Picasso. No wonder I couldn’t get the retouch to work. Now it makes sense. Can’t wait to try this program. I use PhotoScape and run 100 percent of my photos thru as I also use this for resizing all my photos. This free program also does a TON more things. I use Picasa too and love it but I didnt know about the retouch…thanks! Thats amazing!! Thanks for all your tips…keep them coming girlfriend!!! I agree with Tamra, Donna! Where in the world would we be without you??? lol! Thank you for this great tip! I’ve always used Picnik, but am now very anxious to try Picasa. Thanks!!!!! ohmygosh! I love you! that’s how the retouch works? geeeesh…this is why I read blogs. And my hubby just thinks I do nothing all day 🙂 “I’m learning darlin!” I too have always used Picnik, I have Picassa but don’t use it. Guess I’ll jump on this bandwagon. Thanks Donna! I love it too! I really like to make mosaics but did not know about retouching. I have not downloaded it on my new lap top, so I need to put it on TONIGHT! Hi! It’s refreshing to hear that someone else out there is using a point and shoot camera AND so encouraging that you have gorgeous photos. 🙂 I started using Picassa in my pre-blogging days to crop photos. I haven’t used the Retouch feature ONCE and it was right in front of me the whole time. Duh. Thanks so much for pointing it out! 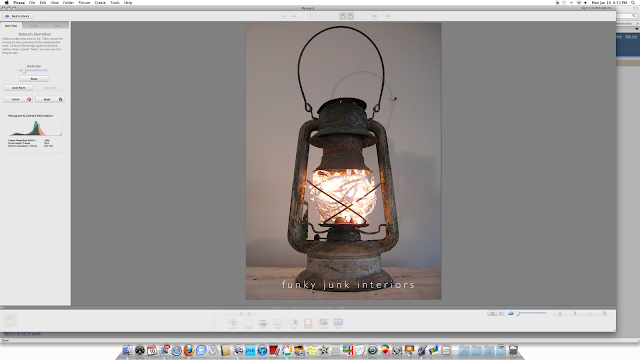 I am new to your blog and I have to say you are a junkin genius. I LOVE your wood shed! It has inspired me to get to work on a dream of mine. I’ve deleted whole cars out of my photos for my mural design projects. I use the Adobe Creative Suite. You can find affordable, fully functional older versions on Ebay. The educational versions are usually even cheaper but can’t be updated. Adobe CS2 is easy to find cheap and you can get guides that help you learn it pretty quickly. I recently bought Apple’s Aperture software, a powerful image manipulation and management tool. It’s like iPhoto on steroids! Thank you. You have saved my sanity…not to mention my pocketbook. I have a p&s and did not want to upgrade. I’m off to see if I can too can make my photos look like I know what I’m doing. I use Photoshop, Picnik, and Picasa to edit photos. I bounce back and forth between those three depending on what needs to be done to the photo or how much time I have. Thanks Donna. You’re the best! Great idea i have shared here. I am using photoshop in editing photos but ill give this idea of yours a shot. Thanks for sharing. the touch ups on the light fixutre blow my mind! crazy good! … i wish life had touch up features!! I cannot believe the before and after of the chandelier! I have a point-and-shoot and use Picasa but obviously have a lot to learn from you! I will stay tuned. Thanks! I have a ? about printing these awesome pics. It seems that photo machines “auto edit” prints, any info as to how to prevent this since we are already editing before having them printed? Interesting approach, I thought that the first lamp is a simple gas one with just some decorations, but when I looked closer I saw the difference. YAY I don’t have to pay for a new version of Photoshop now that mine has expired!! Thanks! Hi Donna – just wondering what you use now for editing since Picassa (my fav too!) has closed down?